It’s kind of like watching an abusive relationship play itself out, right before my eyes. Except, it’s accepted, because it’s an expected behavior in their species. Mr. White is the abusive husband, and the females are his abused wives. 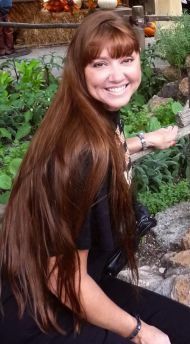 The females routinely get knocked around, beat up, injured, and on Friday, murdered. Mr. White body slammed her so hard, she hit and lifted the tank cover, and flew out the back of the tank. She eventually ended up on the entryway tiles and died. Tony found her when he came home from work on Friday. He called me to tell me and later said it was one of the toughest phone calls he’s ever made. I fed her that morning and didn’t know it’d be the last time I’d get to watch her eat. They’ve lived in this tank for 4 1/2 years and we’ve never had one of them come out of the tank. I know it can happen, I’ve been around fish enough to know that. But when I do my water changes, I leave them unattended for 5 or 10 minutes at a time, with the tank covers off, while I refill my water jugs, and they’re fine. Never had a problem. It’s a total fluke that this happened and such a senseless loss of life. Shortly after I bought the tank in February of 2006, I came home to find one of the cats sitting on top of the cover. I noted to Tony that if that cat managed to somehow fall in, he would drown or electrocute himself — and kill everyone in the tank in the process. In response, Tony built a cover over the cover, so the cats couldn’t see to get up on top of the tank. We were so intent on keeping things out, we had no idea we needed to reinforce the covers to keep the fish in. Tony did that this weekend. 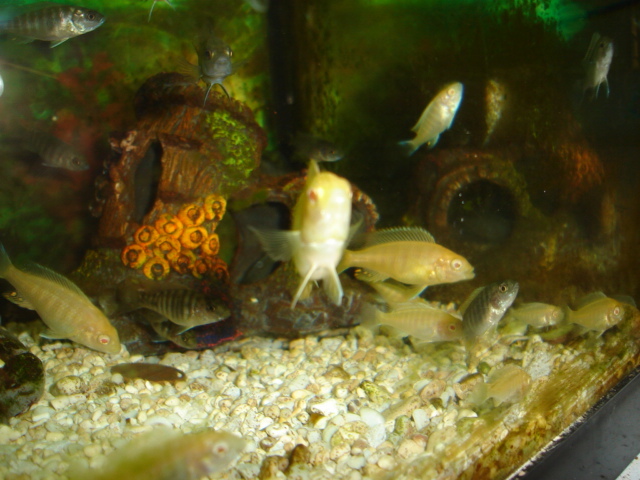 The whole point of having the male (Mr. White) in the big tank is for breeding purposes, but it appears that Mr. White is sterile. So, I spoke to my Fish Whisperer, because I want him to keep a look-out for another Mr. Blue. Fish Whisperer said he’d help me look for a Mr. Blue, but recommended putting a mirror up against the tank while Mr. White is still in there. Apparently him seeing his reflection will make him think there’s another male in the tank, and that is supposed to soothe him. Or something like that. Even weirder is, Fish Whisperer was right — as usual. 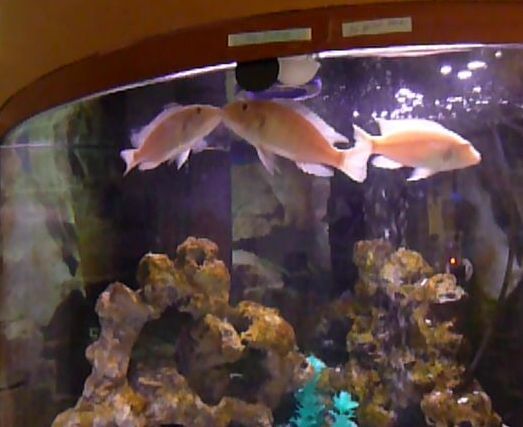 Within seconds of putting the mirror against the tank, he noticed it, he was afraid of it. Within a couple hours, he was contentedly checking himself out, hanging out with his reflection like it was a long lost buddy. Weird. How does Fish Whisperer know this stuff? I cried when I buried her on Friday, the female Mr. White murdered. 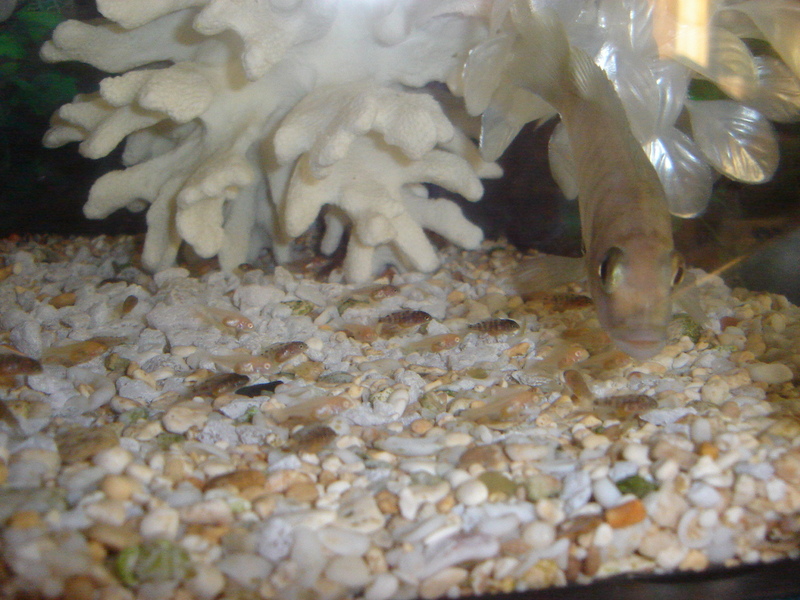 She was one of four albino fry that I hand-picked to keep and raise (out of the 300 baby fish born four years ago). She was the one who, when I introduced a new food, took all of it in her mouth and took off for the corner of the tank, swallowing and swallowing, hogging it all to herself. She was the smallest of them all, and yet when I held her in my hands to bury her, I realized the tank must distort their size, for she was much larger than I had thought she was. And isn’t that the way of life and death… when someone dies, the loss is always larger than you think it will be. Growing up… still babies, though. 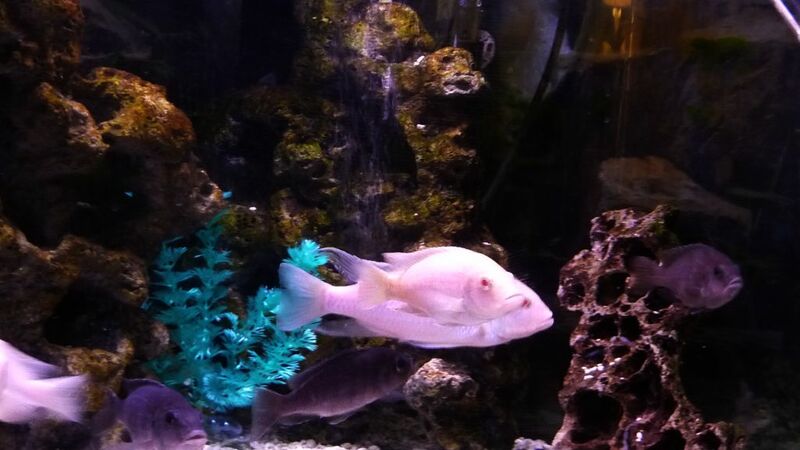 I still have the two females who I isolated in a hospital tank (they each had a fish equivalent of a human black eye), they are looking much better and I’m hoping to put them back in the big tank in a week or two. I type that with a dose of optimism and confidence that I’m a little leery about feeling, just so you know. *All images in this post can be clicked and enlarged.